The families of the Levins and the Shtcherbatskys were old, noble Moscow families, and had always been on intimate and friendly terms. This intimacy had grown still closer during Levin's student days. He had both prepared for the university with the young Prince Shtcherbatsky, the brother of Kitty and Dolly, and had entered at the same time with him. In those days Levin used often to be in the Shtcherbatskys' house, and he was in love with the Shtcherbatsky household. Strange as it may appear, it was with the household, the family, that Konstantin Levin was in love, especially with the feminine half of the household. 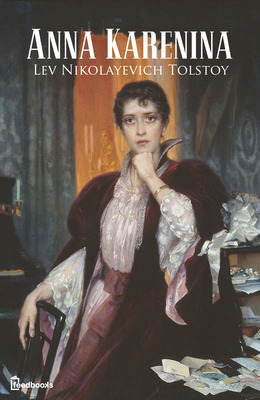 Levin did not remember his own mother, and his only sister was older than he was, so that it was in the Shtcherbatskys' house that he saw for the first time that inner life of an old, noble, cultivated, and honorable family of which he had been deprived by the death of his father and mother. All the members of that family, especially the feminine half, were pictured by him, as it were, wrapped about with a mysterious poetical veil, and he not only perceived no defects whatever in them, but under the poetical veil that shrouded them he assumed the existence of the loftiest sentiments and every possible perfection. Why it was the three young ladies had one day to speak French, and the next English; why it was that at certain hours they played by turns on the piano, the sounds of which were audible in their brother's room above, where the students used to work; why they were visited by those professors of French literature, of music, of drawing, of dancing; why at certain hours all the three young ladies, with Mademoiselle Linon, drove in the coach to the Tversky boulevard, dressed in their satin cloaks, Dolly in a long one, Natalia in a half-long one, and Kitty in one so short that her shapely legs in tightly-drawn red stockings were visible to all beholders; why it was they had to walk about the Tversky boulevard escorted by a footman with a gold cockade in his hat - all this and much more that was done in their mysterious world he did not understand, but he was sure that everything that was done there was very good, and he was in love precisely with the mystery of the proceedings. The mysterious, enchanting Kitty herself could not love such an ugly person as he conceived himself to be, and, above all, such an ordinary, in no way striking person. Moreover, his attitude to Kitty in the past - the attitude of a grown-up person to a child, arising from his friendship with her brother - seemed to him yet another obstacle to love. An ugly, good-natured man, as he considered himself, might, he supposed, be liked as a friend; but to be loved with such a love as that with which he loved Kitty, one would need to be a handsome and, still more, a distinguished man. But after spending two months alone in the country, he was convinced that this was not one of those passions of which he had had experience in his early youth; that this feeling gave him not an instant's rest; that he could not live without deciding the question, would she or would she not be his wife, and that his despair had arisen only from his own imaginings, that he had no sort of proof that he would be rejected. And he had now come to Moscow with a firm determination to make an offer, and get married if he were accepted. Or... he could not conceive what would become of him if he were rejected.